For a unique and distinctive way to carry your cash in your pocket, the authentic JFK Half Dollar money clip is the perfect choice! It is designed in 24 karat gold-plating, polished to a high shine, with protective gold ring around the coin edge and gold eagle on the coin. 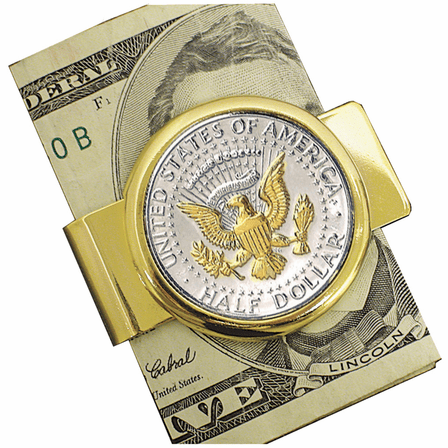 The money clip has a French-fold grip that holds up to 25 folded bills. The JFK presidential seal coin will have a minted date between 1964 to present, and comes in a gift box with Certificate of Authenticity. 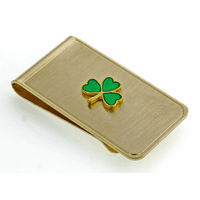 Beautifully made with excellent gold highlighted Kennedy Half-Dollar. It always draws compliments whenever I make a purchase. 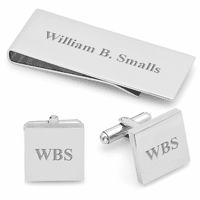 Thanks Executive Gifts, another great accessory. 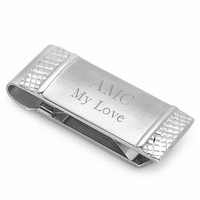 This money clip is very handsome. I got it for my husband as a birthday gift and he loves it.Thank you for good quality with a reasonable price. Bought for my husband for Father's Day to replace a lost money clip. I was very impressed with the quality when I received it. Delivery was very quick too! My husband loves it! Highly recommend this piece.